EAM Pitfall #1 - Putting Software before Strategy | SwainSmith, Inc. This is the second post in our blog series, 9 Reasons EAM Implementations Fail (And How to Fix Them). When it comes to implementing EAM and CMMS software systems, the prevailing school of thought is centered on the software. You buy it, model your asset management operation around what the software can or can’t do, load master data, train, and go live. Then you wait for the results. When the software fails to deliver useful information, the blame game starts. It’s the software’s fault, or it’s a change management issue, or processes are not defined, and on and on. In fact, the problem is none of these—or all of them, depending on how you look at it. Do you remember what Yoda tells Luke in The Empire Strikes Back? He says, “You must unlearn what you have learned.” The same goes for implementing EAM software systems. Designing the operation to fit the software is putting the cart before the horse. It produces a haphazard asset management operation and incomplete, unreliable EAM information. If you want to create ROI and generate meaningful information with your EAM application, you need a different strategy. You have to think beyond the software. Where Does EAM/CMMS Information Come From? Software delivers information—it doesn’t create it. An EAM system needs accurate, consistent data inputs in order to produce accurate, reliable data outputs. For example, consider equipment failure data. 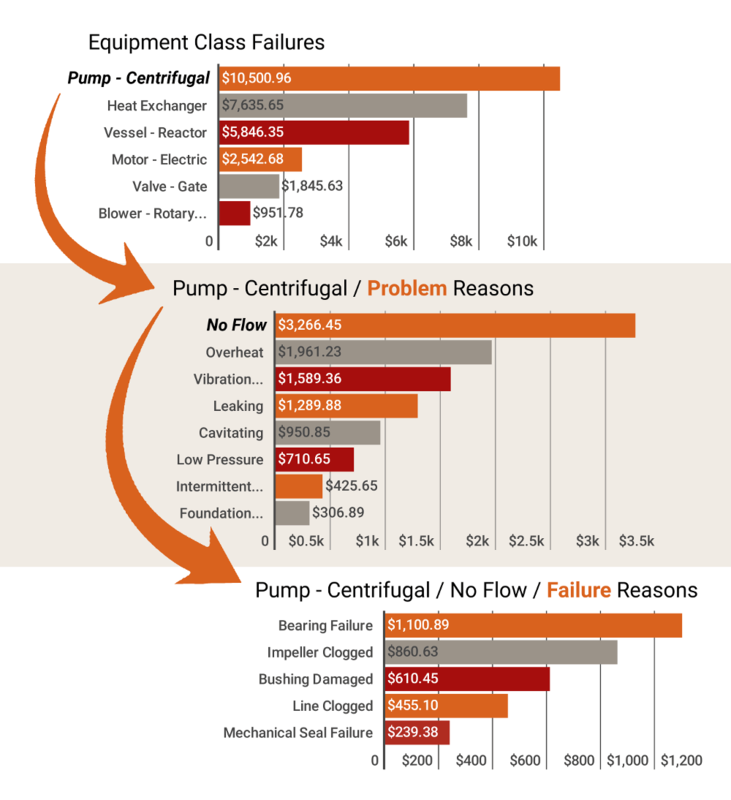 With a successful EAM software implementation, you can easily drill down to find the most common and most costly reasons for equipment failures. As you can see, EAM information has many drivers. A business must think of information as a product, not of the software, but of a system of interacting components. These components include business process, master data, coding structures, assigned responsibilities, user buy-in, and many others. Managing all of the components simultaneously is the only way to generate useful EAM information on a sustainable basis. This is what an asset management system does. An asset management system is a management system—like a quality management system or safety management system—that directs the way an organization maintains and administers its physical assets. 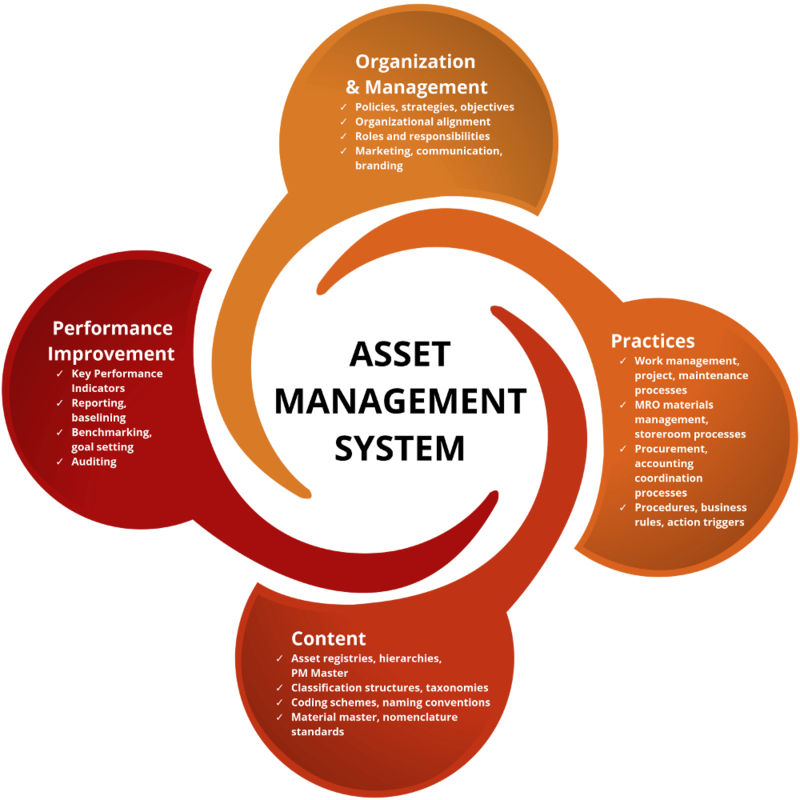 It’s a framework of documented policies, strategies, practices, and processes than an organization adopts in order to accomplish its asset management objectives. An asset management system coordinates all the elements of the asset management operation. Asset management systems provide the comprehensive, holistic approach that is needed to create value with enterprise asset management. You don’t have to take my word for it. The internationally accepted standards for asset management, ISO 55000 and PAS 55, both emphasize the importance of asset management systems for asset-intensive organizations. Experts agree that great asset management begins with a management system approach. Management systems make sense from a process standpoint, but they are also the perfect complement to an EAM software system. An asset management system coordinates all the components that affect the production of EAM information. It provides the consistent strategy and process that an EAM system needs to be successful. Like Oscar and Felix, they look like an odd couple at first—steel toe meets computer nerd—but when you bring management system and information system together, quality asset management is the result. A management system is designed to make you effective, while an EAM system is designed to make you efficient. Both working together help you become effective and efficient at managing your assets. Isn’t that what we are trying to do? When one function (e.g., storeroom) can impact the ability of another function (e.g., maintenance) to accomplish its objectives, you need a holistic approach to improvement—one that doesn’t focus only on software or fixing maintenance, but rather considers all of the key elements that drive success. Improving asset management over the long haul requires a comprehensive effort. You have to follow a management system approach if you want to create long-term success with your EAM system. In the upcoming week, we’ll talk about choosing the right software system and compare the three big options: EAM systems, CMMS systems, and ERP systems. That’s in our next post, EAM Pitfall #2: Using the Wrong Software for the Job.